All marine mammals are susceptible to oil pollution when they ingest contaminated food. From whales to sea otters, all marine mammals exposed to oil can experience congested lungs, damaged airways, emphysema, stomach ulceration, hemorrhaging, eye lesions, skin lesions, and decreased weight and growth rates. Because of their size, their range of habitats, and the difficulties of studying them within a lab, most of what scientists know about oil pollution and marine mammals comes from post-spill observation. What scientists do know for certain is that oil pollution is just as harmful to marine mammals as it is to all other forms of life. Baleen whales are highly susceptible to ingesting oil as a result of the way that they feed. These whales skim surface waters and take in huge amounts of water that they filter to collect their food. Oil residue can stick to the baleen, which lowers the amount of food that the whales can take in. This also exposes whales to the dangerous toxins present in oil. Dolphins are most at risk when they inhale oil and oil vapor. When dolphins surface to breathe, oil can restrict their blowholes and airways. Dolphins surface for air more frequently when stressed, exposing them to even greater harm. Researchers have also found that dolphins can transfer toxic hydrocarbons from mother to child via milk. Marine mammals with fur, such as otters or some seals, are also endangered by oil. Fur acts as an insulator and keeps otters and seals warm as they swim through icy ocean waters. When fur is matted by oil, these animals lose heat quickly and can die of hypothermia. Oil can also restrict movement, sometimes pinning flippers against bodies or making otters or seals too heavy to swim. Seals also use smell to identify their young, and oiled seal pups may be rejected and abandoned by their mothers if they smell too strongly of oil. ​On March 24, 1989, the tanker Exxon Valdez spilled nearly 11 million gallons of crude oil off the shore of Alaska. The oil would eventually impact over 1,100 miles of coastline, making it the second-largest oil spill to date in US history. ​The spill occurred at the beginning of the bird migration season. The U.S. Fish and Wildlife Service estimated that the spill killed 350,000 to 390,000 birds, especially common and thick-billed murres, assorted sea ducks, bald eagles, and pigeon guillemots; 3,500 to 5,500 sea otters; and 200 harbor seals. In addition, killer whales may also have been affected, as their numbers in the area declined shortly after the spill. Two years later, a study of the lasting impacts of the Exxon Valdez spill showed that mortality rates in pink salmon eggs were 96% higher than pre-spill levels. There was a mystery there. While the visible presence of the oil had disappeared, its impact continued to be felt. Today, more than two decades later, we think we know the answer. Recent studies are finding that even indirect exposure to small amounts of the toxins in oil can have profound impacts on animal life, particularly on the young. Seabirds spend most of their lives on the water, making them particularly vulnerable to the effects of oil pollution. A Canadian government study in 2002 estimated that approximately 300,000 seabirds are killed each year off the Grand Banks as a result of illegal discharges of oil from ships. This study also collected oil from bird plumage in the Atlantic and the North Sea over a 10-year period and found that more than 90 percent was composed of heavy fuel oil mixed with lubricating oil, which is only found in the bilges of large ships. Oil is particularly threatening to seabirds because it forms a thin layer on the surface of the water where many seabirds spend most of their time. 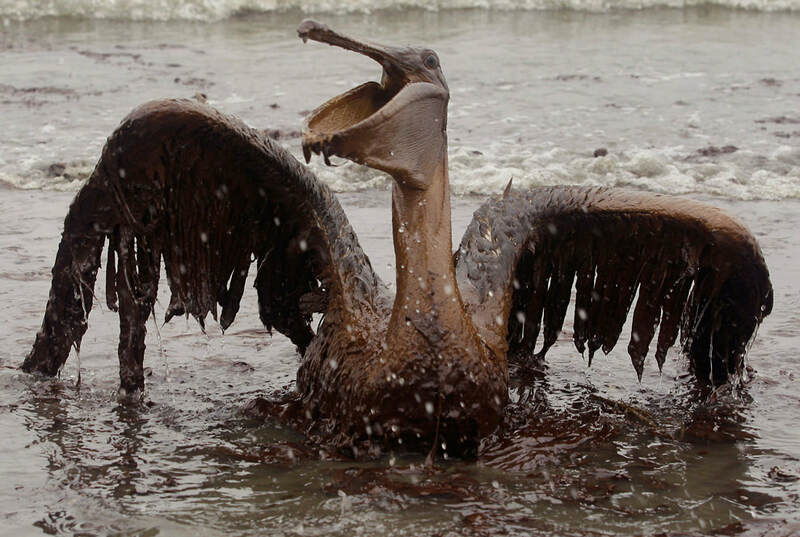 This means that almost any amount of oil discharged into the water is a threat to seabirds. Seabirds can be affected by external exposure to even small amounts of oil because their feathers absorb oil very readily and decreases the feather’s ability to insulate a seabird from cold waters; it also decreases their waterproofing and buoyancy. It can also destroy the delicate hooks and barbs that normally interlock and keep the water away from a seabird’s skin, exposing it to cold waters and leading to death from hypothermia. Oiled feathers can also severely impact a seabird’s ability to fly and find food, causing it to starve to death. Seabirds may also ingest oil directly while preening their feathers, which can lead to fatal or debilitating effects on seabirds’ internal organs and can cause lesions in their kidneys, livers, and stomachs. Seabirds that consume oil have been found to grow more slowly and show impaired development of flight feathers. 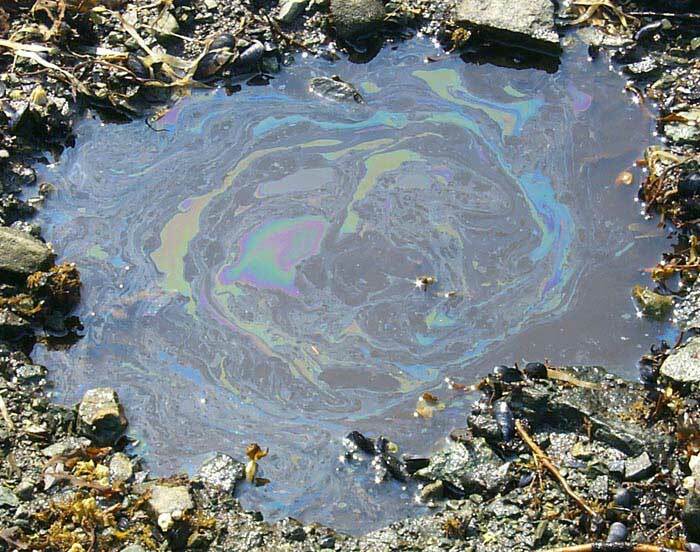 An oil spill does not have to be large in order to devastate a bird population. 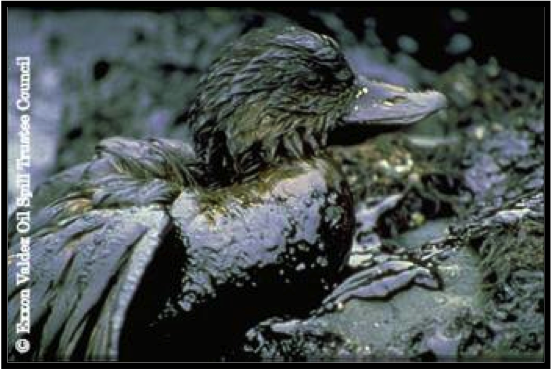 In 1978, the Amoco Cadiz spilled over 220,000 tons of oil off the coast of France, resulting in the death of only 5,000 birds. Two years later, 600 tons of oil spilled in a strait separating Norway from Denmark ultimately killed some 30,000 birds. ​Bird eggs are also extremely susceptible to oil pollution and can be damaged by contact with small amounts of oil. ​Eggs are vulnerable if they are incubating near a shore that is oiled or if their parents have oil on their feathers when they return to the nest. 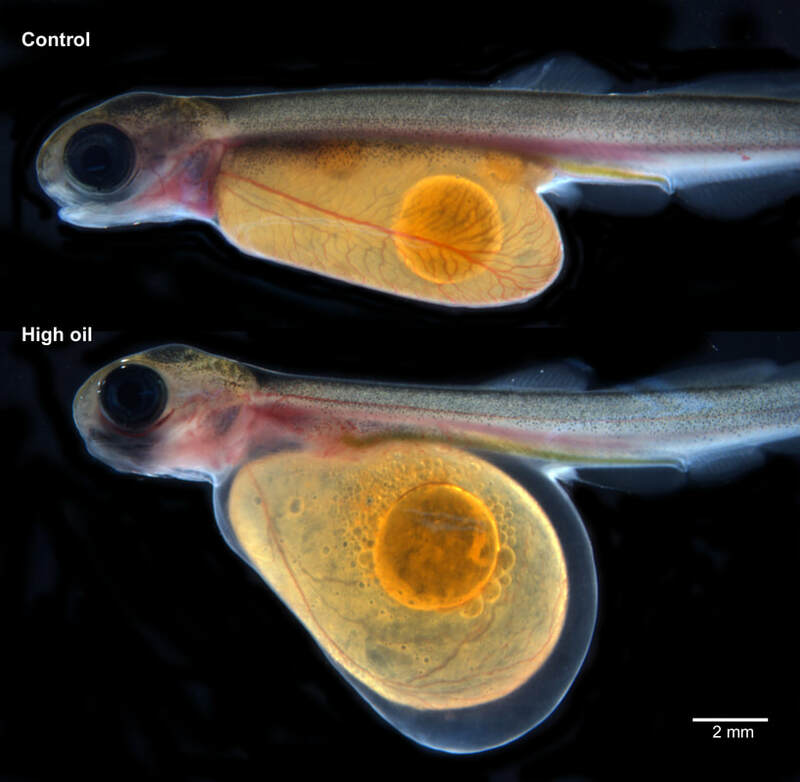 Oiled eggs see decreased hatch rates. Eggs that do hatch often produce offspring with bone and bill deformities as well as with reduced liver sizes and growth rates. ​Researchers studying a breeding group of South Polar skuas following an oil spill in Antarctica near Palmer Station in 1989 witnessed a 100% mortality rate among chicks. They found that adult skuas that became oiled while hunting for food would travel to freshwater ponds to clean themselves instead of returning immediately to their nesting areas. This delay caused a breakdown in pair coordination, which left chicks unguarded. Within a few weeks after the spill, every chick in the colony was dead, killed by other skuas, despite never coming into direct contact with oil. ​When a large-scale spill happens, most fish avoid being smothered by simply swimming away. However, there is some evidence that fish can be drawn to oil floating on the surface of the water, perhaps in an attempt to hide in the shadows from predators. If oil coats the gills of these fish, they can die from asphyxiation. Fish that are exposed to smaller amounts of oil often develop fin erosion, skin sores, liver damage, and cancer, and they can also bioaccumulate dangerous chemicals known as PAHs. In addition, they tend to produce fewer eggs, impacting future generations. Bioaccumulation occurs when an organism survives exposure to a toxic agent but retains high concentrations of the toxin in their bodies. When humans or wildlife consume fish contaminated with high levels of PAHs, they are also exposed to the dangers of those toxins. Researchers at the National Oceanographic and Atmospheric Administration reported recently that direct contact with oil is not required for PAHs (the toxins in oil) to harm fish and other living organisms in the marine environment. They showed that exposure to even small concentrations of dissolved PAHs (as little as one part per billion of water) caused the death of pink salmon embryos. Other studies have shown that exposures to PAH concentrations as low as .7 parts per billion caused developmental malformations and genetic damage, decreased size at hatching, impaired swimming, and even death.